First up on our to-do list was the kitchen. Although we would have loved to have "gutted" the whole thing and started from scratch (or, rather would have loved to have been able to hire someone else to come in to gut the whole thing and start from scratch), it just wasn't in our budget. So, we decided to embrace what was there and work with it to the best of our ability. We're not professionals and I'm sure there are those who would have done things differently, but we love how things turned out. It may not be considered a "high-end" kitchen, but we're thrilled with what we were able to accomplish on our own. We were pleased with the layout of the kitchen, so we only (HA!) needed to update the cabinets, make some (major) improvements to the grout countertops, drywall over a built-in wall shelving area that we didn't care for (shown in the top BEFORE photo - on the long wall to the right), paint the room and install new trim. And, although I don't particularly love white appliances, the stove, dishwasher and fridge are in great shape and I can live with them for the time being. I, also, stained an existing island that I already had on hand from our previous home and I stained two large, antique oak cabinets that I already had. The massive amount of storage in those pieces is amazing and perfect for housing my collection of blog staging dishes, props and the like. Furthermore, I spent some time on the counter tops (fixing up the grout, cleaning the tile and applying several coats of a high-gloss sealer). We did some major cleaning of the appliances, installed new curtains, repainted the walls and installed new trim. Final Notes: Overall, we are pleased with what we have accomplished thus far. I am planning to install a newer back-splash behind the stove very soon. And, eventually, we will update the appliances and stove hood. Also, I am in search for new knobs for the large oak cabinets that we brought from our previous residence. However, they are pretty old, so finding exactly what I am needing is proving to be quite the task. We tore out the carpet and entry tile. And, that dark, lower wall paneling HAD to go. Drywall patching is complete and new flooring went in. New ceiling lights are going in soon, new paint is up on the walls, blinds have been deep-cleaned, trim has been installed and we're now in the furnishing stage. If you'd like to follow along with Joyously Domestic on our remodel journey (and stay up-to-date when new recipes, holidays ideas and other new posts are shared), you can find us on Facebook, Twitter, Instagram, Google+ and Pinterest. And, be sure to subscribe to our emails. Amazing what you did so inexpensively. Quite inspiring. Glad you shared. This is incredible!!! 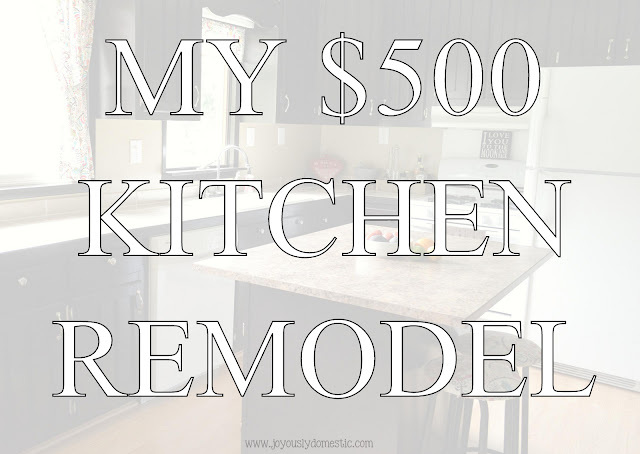 It looks like a brand new kitchen for less than $500......I have always loved your food posts but this is exciting to see a transformation that most people would pay someone to do! What an inspiration you are to others! I look forward to watching the rest of your home improvements, thanks for sharing! 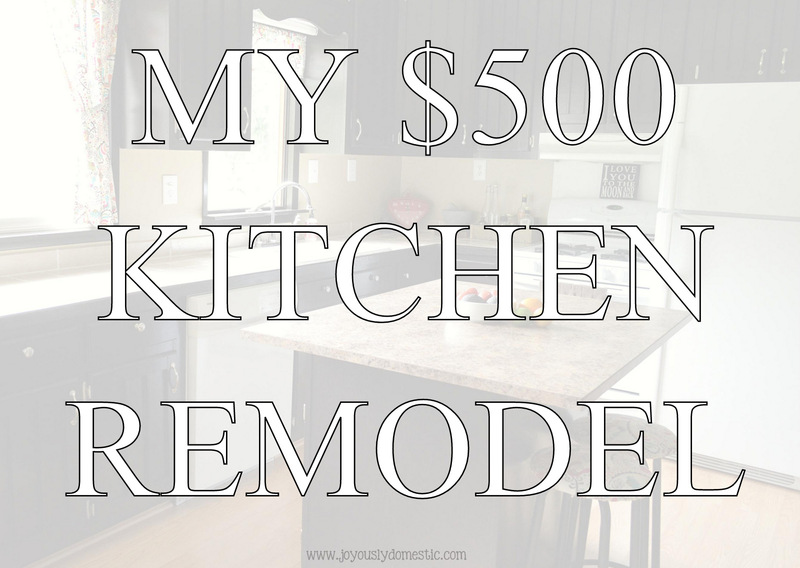 I love the renovation and for less than $500. I can't wait to see the remodels to come. Thank you for sharing your great ideas! Wow! That is So awesome! What motivation too! Thank you for the kind comment, Angie. Great Job!! I am a Interior Designer and I LOVE what you have done, especially for $500! !